instance. You will need to reset your Dynamic Surroundings config file and re-apply your changes. it to be compatible. Tutorials on the changes can be found on the wiki. New deep forest day and night biome sounds. Applies to Roofed Forest as well as some Birch Forest variants. Footstep sounds on LittleTile blocks. Footstep sounds on ForgeMultipart blocks. Cosmetic Armor Reworked compatibility. Use rendered armor model as the basis for selecting armor acoustic accents when moving. Improved compatibility with Just Enough Dimensions. Moved Battle Music into a resource pack. 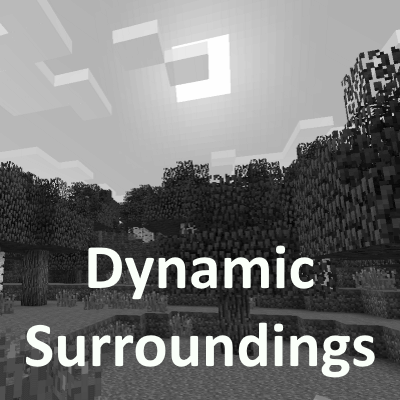 As a result resource packs can be made for Dynamic Surroundings. Moved critical hit power words into an external file so they are now translatable. Added 2 new sound categories for controlling sound volume of biome and footstep sounds. These will show up in the sound volume control dialog. Cleaned up mod configuration file. Client should no longer crash if there is a mod dependency issue. Render of modded potion icons in potion HUD display. Reload biome registry whenever a world loads. Should address issues with OTG/Biome Bundle. Eliminated MusicTicker replacement. Should improve improve compatibility with other mods that deal with the ticker. Removed reset rain on sleep configuration option. It was little used and broadly improves compatibility because it eliminates some ASM. Removed rain control parameters. These options were seldom used and materially impacted gameplay. Removed Albedo support. Looking for a library replacement. Removed sound routing. Crafting sounds for other players will not be heard. Removed Entity Emojis. Little used feature. Removed explosion enhancements. Caused too much lag with large explosions. Removed Presets! If there is enough demand I can roll it into a separate mod. Split library functions into a separate JAR (OreLib). There were a lot of internal changes made to restructure the mod and to support block variants rather than block metadata. Moved away from Trove collections to FastUtil collections. Improved validation of Json configuration files during load.